I think part of my problem with updating my blog is that lately it seems like I don't have as much time to write out nice, long, interesting stories to go with my recipes. Or at least I think I don't have time; the older I get the more I realize that once I determine that I want to make the time to do something, I somehow magically make the time. Funny thing, time; sometimes it flies, sometimes it drags, and sometimes it can actually heal all wounds. Or so they say. The story behind this one is short and sweet, so I'll endeavor to keep the entry the same; maybe that will make it easier ? PROBLEM : person buying rolls for last weekend's cookout does not understand math, leaving you with about three times as many rolls as you have sausages. 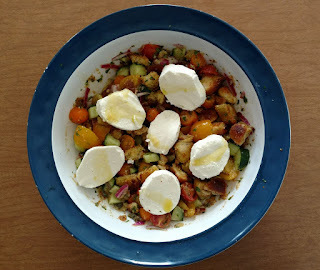 SOLUTION : Panzanella with Heirloom Tomatoes and Fresh Mozzarella. Serves about four, depending on if you’re serving anything else with it. Heat the oil in a large sauté pan. Add the bread and salt; cook over low to medium heat, tossing frequently, for 10 minutes, or until nicely browned. Add more oil if needed. Set aside to cool a bit. In a large bowl, mix the tomatoes, cucumber, red onion, basil, and capers. Add the bread cubes and toss with most of the vinaigrette; add mozzarella and drizzle with remaining dressing. 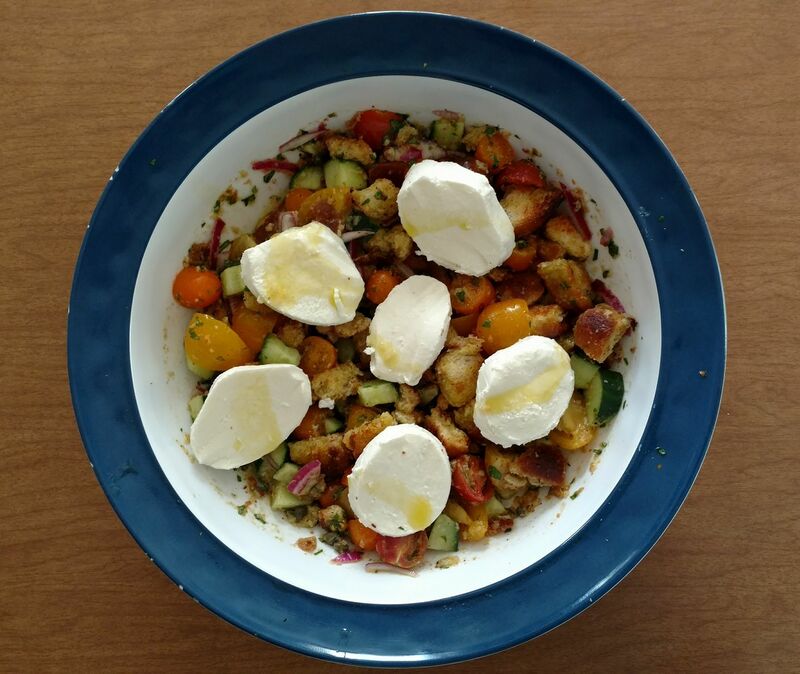 This particular panzanella can be served right away, or you can allow it to sit in the fridge for about half an hour for the flavors to blend.